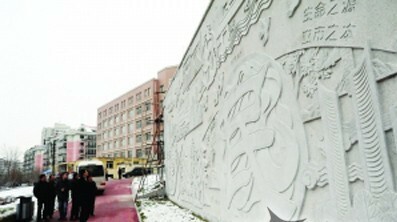 Recently, a granite mural with 460 square meters was completed at the coast of Hejiagou in Harbin. From the Construction Committee of Harbin, this fresco is made by sorghum red granite as the materials, which is one of the largest granite murals in Harbin province. The pictures set a river as the main line, which form a beautiful "S" curve, the Ruyitou on the right side take the meaning of "best back". The picture is with the two word: "people" and "life", which outstanding the people's livelihood project: the management of "three groove and a river", also has been paying attention to the people's livelihood. It set all the sunlight as the center, indicate that the beautiful future of developing Harbin. It is a beautiful city environment after management below. The pictographic design of the big word-"water" at the center embodies the importance of water, as well as the relationship between human and water. The picture also shows bad environment before managing and the pain of the people. The new characteristic buildings and long history of Harbin shows that Harbin is a famous cultural city. The picture of the mural painting strews at random, vivid and flexible, the combination of decoration and realistic. Why Does the Stone Market have Strong Competition in the Middle East?